I’ll be honest: before my wife introduced me to pubic hair shavers, I hadn’t paid any mind to them. You heard me right. I was just hacking my way through with the traditional Gillette blade and shooting for the best. The thought of a dedicated grooming tool hadn’t even crossed my mind, seriously. A few years later, I know better. My wife sticks to her Philips Bikini Perfect from Amazon.com, I’m with Norelco 7100 from Amazon.com. As these might be a bit expensive for some, we’ve made an effort to introduce to you more budget-friendly options too. Hope you enjoy this list of the best pubic hair trimmers and shavers for men and women. I know that my life is quite more convenient since I discovered the key to quality, efficient grooming around my private parts. With the Norelco Series 7100 you’re not only getting a pubic hair shaver. You’re getting a whole multi-purpose tool for all your private grooming needs. This means that you can also trim or shave your chest, legs, underarms and shoulders aside from your groin. Let me first point something out: the 7100 is a pube trimmer and an electric shaver for your pubic area whcih is why it falls among out best pubic hair trimmers on our list. Depending on your preferences, you can either trim to stubble, or completely eradicate groin hair. The Norelco 7100 is convenient. Why? Mainly due to two things. First, it has a pivoting head that is extremely flexible and follows your body’s contours. Sometimes shavers for pubic hair are very unintuitive in their movement. Not this model. Expect it to glide properly over your delicate parts and perform smooth, precise cuts. 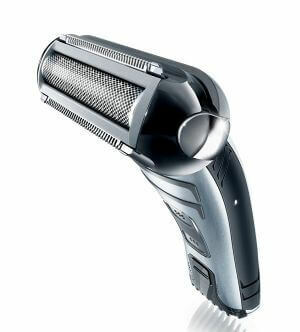 Truly Philips’ best shaver for pubic hair, the 7100 comes with an adjustable comb. You can pick from 5 lengths, adjusting the trim (or cut) from 1/8″ to 11/25″. 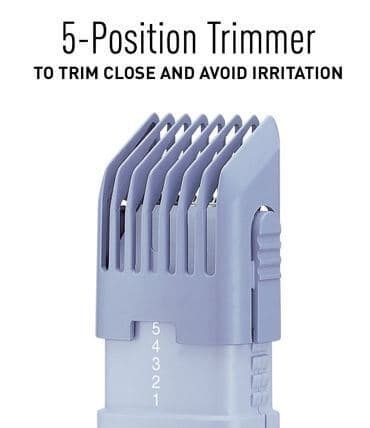 Nobody likes skin irritation, especially when it comes to using a pubic hair trimmer. The self-sharpening steel blades of this model are designed to eliminate risks of irritation. They will be the gentle to your delicate parts, so don’t worry about it. You’re looking one of the best pubic hair trimmers that also cordless, making it ideal for pubic hair. The Norelco 7100 actually performs quite good with 50 minutes of battery life on only 1 hour of charging. Quite convenient considering how much it takes for other electric shavers for pubic hair to get up and running again. Everybody knows trimming your groin hair in the shower is more convenient. Good news: the 7100 is water resistant so you can use it in the shower too. Of course, if you prefer doing it the dry way, you are free to do so. One nitpick I have with this Norelco genital shaver is the trimmer, as it could cut just a little bit closer. Its replacement parts can also run expensive. Also, remember to let the personal hair trimmer charge for 24 hours initially. However, as a whole, this is the best pubic shaver + pube trimmer for men combined in one product. With a great battery charge, quality blades and good grip on the body, the Norelco 7100 doesn’t leave much to be desired, its one of our best pubic hair trimmers. You get a high-precision, long-lasting pubic shaver and pube trimmer in one amazing tool. Shavers for pubic hair are alright, but a lot of people still prefer grabbing the razor. The ProGlide Styler takes a twist on that and presents you with an outstanding pubic hair razor. Especially considering its budget-friendly price. 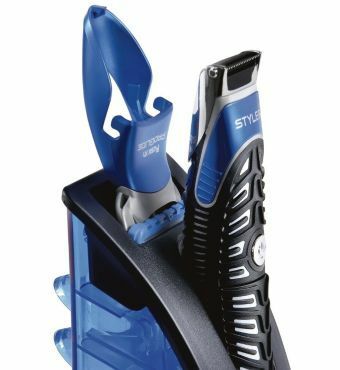 This genital shaver system includes a trimmer, one power cartridge (ProGlide), 3 combs, a battery and an organizer. You just use the slim personal trimmer body and slap Gillette’s quality blades onto it. The combs provide additional length adjustment. Gillette have really thought this pubic hair razor properly, which is why it makes it to our list of the best pubic hair trimmers. The tool is very slim, extremely ergonomic and quite lightweight. It’s more maneuverable than many pube shavers on the market. Of course, what really matters is how the blades perform. With a trademark Braun technology, the precision edging steel blades will take care of your groin area impeccably. The cuts are smooth, even and extremely gentle on the skin. If you use the combs, you’ll be using this as a pubic hair trimmer. Picking a naked blade will cut closer, but be careful as the blades are quite sharp. You’ll see a green strip on your Fusion ProGlide razor for pubic area. This is the lubricating strip and when it turns white, it’s time to change the blade. The timefrime depends on how thick your hair is and how often you trim your private parts. This Gillette pubic hair razor can be used for wet shaving. Just grab the genital trimmer and get to work while you’re having a shower. Also, ProGlide Styler runs on 2 AA batteries. They should last you anytime from a month to two months. I’ll be honest that this is better suited for blade enthusiasts. Compared with the best shavers for pubic hair out there, the ProGlide Styler can feel somewhat limited or not that convenient. However, if you’re the type that sticks to conventional razors, this is your jam. Considering its very affordable price, this is one of the best pubic hair trimmers sets plus razor for the pubic area that’s in line with anyone’s budget. If you want a pube trimmer but don’t want to spend much, the Norelco 1100 is the best personal trimmer option for you. It’s easy to use, lightweight and gets the job done surprisingly good for its price. Preface: look, this is not an all-in-one groomer like the Norelco 7100. This one is mainly targeted at delicate areas (yes, you can use it as a ball hair trimmer too if you wish!) It’s also not a pubic shaver. With that out of the way, let me say I’m impressed with this one among our top picks and best pubic hair trimmers. First, you’ve got quite the length adjustments here. This Norelco personal trimmer lets you go from 7/64″ (~3mm) to 1/64″ when it cuts. 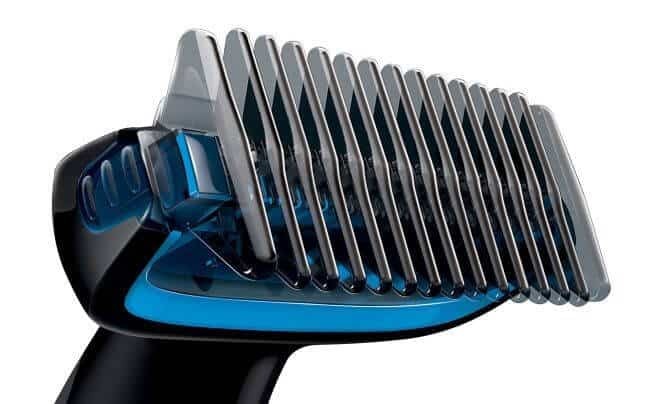 Additionally, you’ve got a 1/8″ comb for longer hairs. What stands out is the cutting technology of the 1100 groomer. The blades cut in both directions, forwards plus backwards, when you move with the pubic trimmer. This results in extremely precise cuts with almost zero hair left behind. While doing so, the private parts groomer also protects your skin via an intelligent skin protector. Very clever and something any person with sensitive skin will treasure deeply. 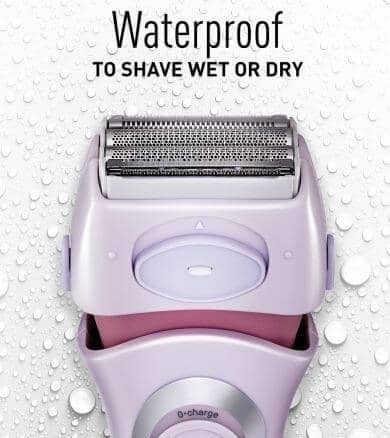 Amongst our best pubic hair trimmers on a budget, the Norelco 1100 is water resistant and you can once again use it in the shower. Wet or dry operation are both alright, but it will work better on dry skin. 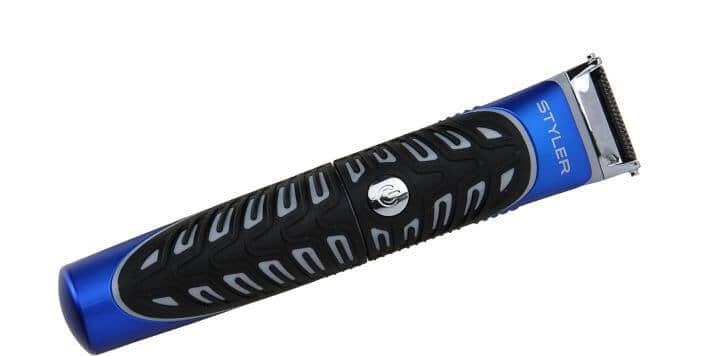 Similar to the ProGlide Styler, this pube trimmer runs on 2 AA batteries. The cordless mode is very convenient, as is the fact that you only need to rinse it under warm water to keep it clean. The only drawback is something I already mentioned: this is not a pubic hair shaver. It will provide you with a close groin trim, but if you want to cut all private parts hair off, switch to the Norelco 7100. Men have the Norelco 7100 as their go to All-in-one pube shaver. The women’s equivalent is Philips Bikini Deluxe, a female trimmer, shaver and…everything, really. Let’s take a closer look at my wife’s favorite grooming tool for delicate areas. Quite a great choice among the best pubic hair trimmers right there! In addition, with this pubic shaver for women, you’ll also receive tweezers, a travel bag, and an exfoliation glove. While my wife hasn’t used the glove and tweezers much, they are a great addition. Let’s talk about the genital shaver itself. First of all, it’s cordless so you have absolute freedom in your grooming. The battery life is quite spectacular at 60 minutes, one of the best times in the niche. The bikini shaver will charge fully in 10 hours. The cordless operation is supplemented by the Bikini Deluxe’s wet or dry mode. You can freely take care of your private parts under the shower. Cleaning it afterwards is quite easy too – just rinse with warm water and don’t concern yourself with extra maintenance which is why it made it to our list of the best pubic hair trimmers. Wondering about the smoothness of your skin? Worry not. This thing is extremely gentle on any skin type, so you won’t suffer from the dreaded irritation when shaving. I have to stress on this: the HP6378 isn’t limited to being an electric shaver for pubic hair. You can use it for anything from eyebrows to armpits and feet. After all, you’ve got six attachments with versatile uses for any lady’s needs. That said, my wife points out that the epilator could be a bit better. If you want to use it, it’s not bad, but a dedicated standalone epilator might prove better for you. 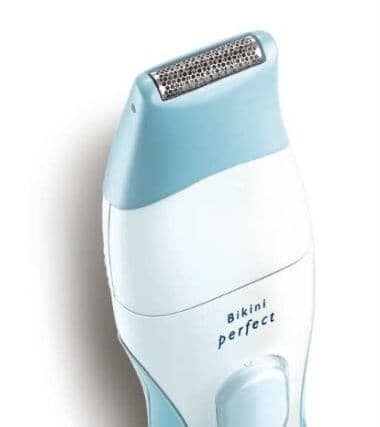 Indeed, the female pubic hair trimmer function is the strongest and highest quality part of the Bikini Deluxe set. If you’re looking for a more affordable among the best pubic hair trimmers options that still offer you a lot, Panasonic have got the right thing for you. ES2216PC can be used not only for your delicate parts, but also for your legs, underarms and other sensitive body areas. The model is based on four floating pube shaver heads. They glide along your body, tracing the contours of your skin. As you can guess, this allows for more precise, close cuts that skip on irritating your trimmed areas. 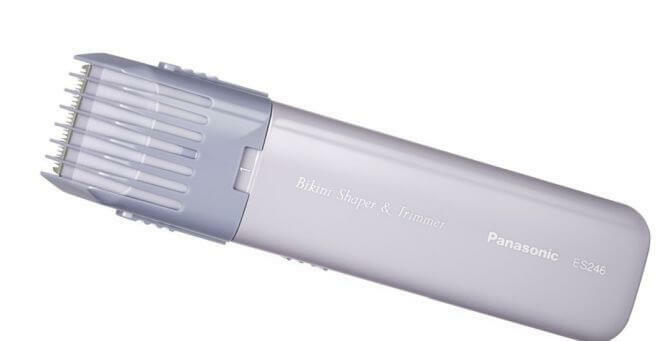 As a women’s personal trimmer, Panasonic ES2216PC also features a snap-on bikini trimmer attachment. With multiple lengths to choose from, you can shape your intimate trim just the way you want it to be. All pubic shavers feature smooth cutting blades gentle on the skin. The ES2216PC shaver for women does exceptionally well here, though. Its hypo-allergenic blades will glide through even the most delicate skin without causing irritations or bumps. Another forte is the design. Admittedly, most female pubic shavers are quite slim, lightweight and eye-catching. Still, this Panasonic model goes even further, combining a soft, ergonomic body with a convenient cordless operation. With the cordless mode, you get 30 to 60 minutes of wet or dry shaving, depending on your preferences. Panasonic recommends the dry mode, which is critical to consider when choosing from our list of the best pubic hair trimmers. However, usually getting some foam or gel and trimming your intimate parts under the shower is more comfortable. As for maintenance, this Panasonic shaver for pubic hair is quite straightforward. You just need to rinse under water and the leftover hair (or gel/foam if you used some) will be gone in a few seconds. 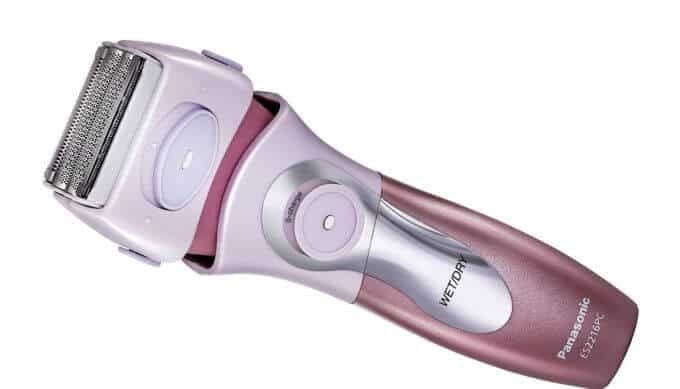 One particular weakness of this pube shaver for women comes up when the battery’s low. In this case, it can pull your hair. Its battery life could also be a little better as it usually lasts for 30-35 minutes. Still, at its pricing point, this is one of the best pubic hair trimmers and or shavers you’d want. An absolute best seller, this little female personal hair trimmer is your best budget option. Don’t think it’ll be stingy on providing you with a quality trim, though! First of all, the lightweight body. This model is exceptional in this regard with its 4 ounces and 1.5″ width. Easily the most maneuverable pubic trimmer for ladies out there. Convenient as it is, it also features smooth tips on its head to eliminate razor bump occurrences. Panasonic ES246AC comes with 5 adjustable lengths for your personal pleasure. You can shape your delicate areas however you wish by simply picking your desired trim length. The design protects your skin from direct contact with the blades. As expected, the blades are great for sensitive skin. They also go through different hair types without too much hassle usually. Two fully charged batteries here will net you around 45 minutes of cordless private area trimming. Quite good considering the price point of this neat little pube trimmer. Keep in mind that this is intended for dry shaving. The downsides to this female pubic hair trimmer are mainly two. First, it’s not waterproof, so you can’t use it in the shower. Second, you need to use the cleaning brush included in the kit, as you can’t simply rinse the intimate groomer under the tap. These maintenance and functionality issues aside, Panasonic ES246AC is a very good bargain for its price. It’ll help you trim your delicate area properly and deliver smooth results without hesitation. what do you think about the norelco 3100? its a little more expensive than the 1100 you mention here. is it bad? No, it’s not bad at all — in fact, it’s the perfect “middle ground” between the 7100 I have and the cheaper, basic 1100. I just thought it’d make sense to offer an affordable model for pubic hair trimming, and the all-in-one, more comprehensive solution. That said, I’ve tried both, and I really think the versatility of the 7100 model is worth it. Depends on what you want to use the trimmer for, of course! Thanks for this informative and insightful article, I’ve been trying to decide between a Philips and a Gillette for a while now. Do you know if the Philips Norelco Multigroom 7100 works as well as the Bodygroom 7100? Thanks in advance. Hi M, sorry for the late response, our team was offline for a bit! Probably it works well too, but at least I would recommend getting the product that’s specifically designed to deal with our nether regions. If you’re looking for that, of course! Is this better than the Norelco OneBlade? Which one specifically do you mean? Hello. I have a question about the Philips Norelco Bodygroom 1100. If I use the trimmer once a week on the armpits an groin area, how often do I have to replace the blade? If you’re only looking to trim those two areas and the hair is not super wiry or thick, I don’t believe you will ever need to replace the blade. The whole unit will likely need to be replaced before the blades wear out.